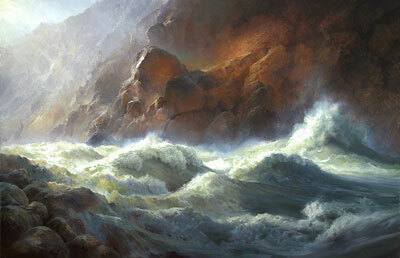 P. A. Nisbet, Lava Falls, Oil on Canvas, 24" x 36"
“There’s no way I am going to survive this…” So thinks the novice river runner upon first beholding the astounding fury of Lava Falls in Grand Canyon National Park. I felt that way twenty years ago on my first trip, and indeed I did survive Lava, and also Crystal, Horn, Granite, Grapevine, and many other world class giant rapids that lace the 226 mile passage. These days a great many people make the journey with experienced river guides on a variety of rafts, dories, and kayaks. It wasn’t always so easy to complete, especially during the first transits achieved by John Wesley Powell and his intrepid band of explorers in 1869. For me the primary challenge was the rapids, but after my first trip down river the beauty of the place became so compelling I resolved to paint it. So I packed up my gear and attempted it four more times, learning along the way that it’s a lot easier to observe and enjoy beauty from a boat than to paint it on site. First, you have to be in a crowd of like-minded people, that is, artists. Otherwise you have a disgruntled group of beer swilling sightseers complaining that you are always holding up the trip. 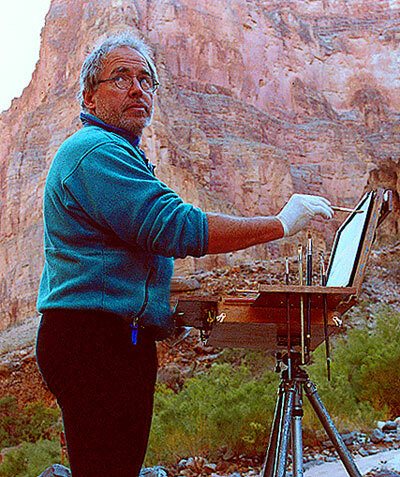 Because to paint on location, one must unpack the gear from water-proof bags, hike from one hundred yards to two miles to get on site, set up the easel, paint for two hours, hike back, repack and get onboard for the next spot. And to get any serious work done this routine is played out three to four times a day for eighteen days. Here’s the long and short of it: inspiration; perspiration; exasperation; exaltation and exhaustion. 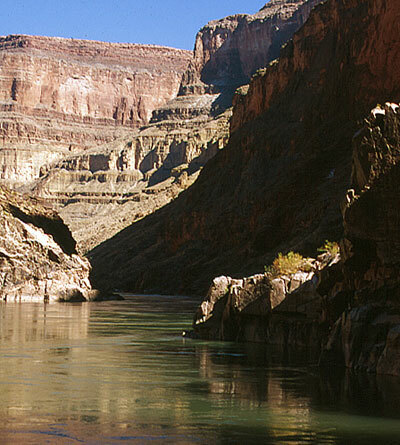 That’s a Grand Canyon River Painting Expedition. 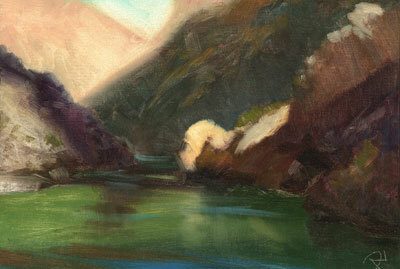 We completed one of these last May with thirteen artists and six professional guides. The head guide, David Edwards, is an outstanding photographer who has had work published in National Geographic and Atlantic Monthly. Just as impressive is his record of over a hundred ten guided river trips through the Canyon corridor with no fatalities. That’s an achievement because the Colorado river kills people who are unlucky or who aren’t paying attention. One of the guides on my first trip down river, a veteran of eighty trips, used to say…”If the River wants you, the River’s goin’ to git you!” It got him in 1985 when his plane crashed into the Colorado and sucked him under for the last time. It is only appropriate that a place as violent and beautiful as Lava Falls should lead off this exhibition. In prehistoric times a series of volcanic eruptions sent millions of tons of molten lava into the river, dams were temporarily created and then breached. The resultant chaos of gigantic boulders created what is today the biggest rapid on the Colorado. No attempt is made to run it without first scouting the passage from above. These moments before running the falls are filled with anticipation; the guides draw diagrams in the sand marking how they will enter the conflagration and which deadly hole they will pull to avoid. Everyone waits above the fray to see what the first boats will do. Then, when it is your turn, life vests are tightened and positions are taken for the entry. From the front of the boat, the view is impressive: down the glassy tongue of the rapid and up and over the first five foot standing wave, and then down, ever downward into the boiling mayhem of Lava. Immediately overhead looms a ten foot wall of water. The bow smashes into it, a shock of ice cold and the lights go out for a moment. Then you break through into the light and take on the next and the next until the rapid is finally vanquished. An experience like this is worthy material for a painting and I consider my final version of Lava Falls to be one of the best paintings I have ever done. The painting came about in the following manner: we arrived at the head of the falls on a hot May afternoon. The boats were moored upriver a mile from the mouth. As the sun was setting I quickly grabbed my kit and mad a dash for the last light. I had to navigate a grubby trail that skirted the river and made passages through rattlesnake territory (one person was struck here last year). After fifteen hard minutes I was standing on river boulders, frantically assembling the easel. The sun was sinking fast, the very last blast of light was so brilliant I could hardly see. Five minutes left…the paint was laid out, I reached for turpentine and inadvertently nudged the easel which then toppled over and made a hard crash on the rocks. All the while the falls just roared (laughing? ), and the last light fell away behind the west escarpment. 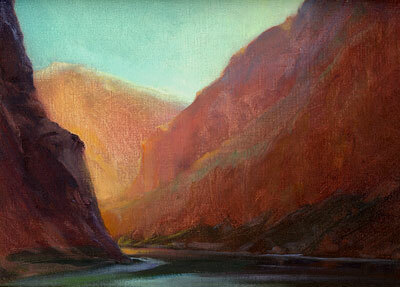 P. A. Nisbet, Corridor, National Canyon, oil on canvas board, 9" x 12"
To say I was frustrated would be an understatement. The moment was gone…or was it? Carefully gathering up the brushes I figured I had come too far to quit. 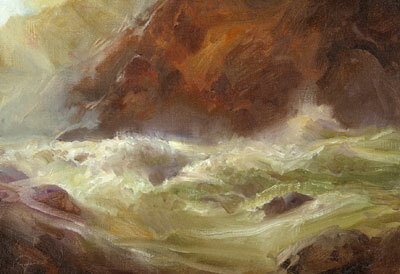 I decided to just wing it and do the painting in the light of memory, which was fresh with energy. I worked in the deepening gloom for an hour and completed a 9” x 12” sketch (which was later sold). It had all that I wished and something extra. Long after the trip was over, this sketch stood out among the others. After some deliberation, I opted to attempt the piece again as a 16” x 24” (sold) and finally the larger 24” x 36” painting presented in this exhibition. Paintings finished in the studio are usually very different creations than their smaller forebears, the field paintings. I present them both in this exhibition so that the immediacy of the moment that is present in the sketches can be enjoyed as well as the more finished studio works. P. A. Nisbet, Study for Lava Falls, Oil on Canvas on Panel, 9" x 12"
Painting in the Grand Canyon is very different from painting on the rims. There are few people to speak of, the silence of inner canyons is overwhelming. Every turn of the corner brings a new surprise, almost always a pleasant one. The light is awesome to behold. It pours into the chasm, bounces along walls and settles into nooks so distilled and pure you might think you were in paradise. And so it actually is; a true paradise on earth. 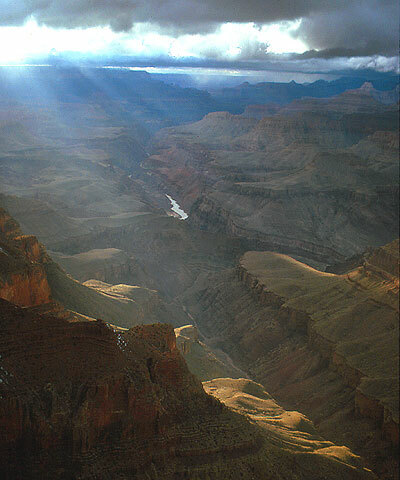 The Grand Canyon viewed from Lipan Point. The Colorado is central to the rock universe it has created. From the south rim the river's fury is all but forgotten, save the whisper of rapids when the wind is in your direction.